As J. D. has noted, we’ve gotten some very good news on the publishing front the last two days. Yesterday, Ted Savas told us that less than 50 copies remain of the second printing of Plenty of Blame to Go Around and that he has ordered a third printing. This is the first time that one of my books has gone to a third printing, so this is virgin territory for me. Today, we got the good news that the publication date for One Continuous Fight: The Retreat from Gettysburg and the Pursuit of Lee’s Army of Northern Virginia, July 4-14, 1863 has been pushed up from June to May of 2008. Ted also told us that the price will be $34.95, which is a really good price for a book that will be more than 500 pages long. Finally, Ted told us that the book clubs are extremely interested in the retreat book, which is also very exciting news. All things considered, today was filled with nothing but good news for the financial prospects of my book projects. 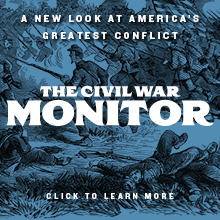 The Civil War spawned countless human narratives, each seemingly more heart-wrenching than the last. But few of those narratives matched the drama surrounding the final moments of Confederate Col. Isaac Erwin Avery. The date was July 2, 1863, the opening day of the Battle of Gettysburg. Avery’s North Carolina unit was ordered to attack a heavily fortified Union position on East Cemetery Hill. Leading the charge on a white horse, Avery was struck in the neck by a musket ball. That final message is preserved in historical archives in Raleigh, N.C. But for nearly a century and a half, Avery’s descendants have been trying to discover where his body is buried. Now they know, thanks to the efforts of a Hagerstown history buff named Richard Clem. Clem, 67, says he’s always been fascinated by the story of Avery’s death. Indeed, Avery’s family knew only he had been buried on land overlooking the Potomac River at Williamsport as the Rebel troops made their long march back home. Members of Avery’s family made repeated trips to Williamsport right after the war, continuing their hunt for his grave up to the 1960s. Unknown to the family, Maryland Gov. Oden Bowie had appropriated $5,000 after the war to find and rebury the thousands of Confederate soldiers buried in shallow graves near Sharpsburg, Williamsport and other areas of Washington County in western Maryland. The governor bought three acres inside Hagerstown’s Rose Hill Cemetery for what became known as the Washington Confederate Cemetery, conscious that many Northerners objected to burying fallen Rebel soldiers in the national cemetery at Antietam. Clem obtained a list of the 346 identified Confederate bodies that had been reinterred. There are 2,122 unidentified Confederates buried there, as well. “These two minor errors were common during the Civil War and are understandable when considering the marker at the grave site, more than likely made of wood, and … badly weather-beaten and barely legible” by the time Bowie’s workers found the Williamsport graves, Clem wrote. Further proof, he said, is that the list shows that three other soldiers, also from North Carolina, were found buried nearby. Avery’s family was delighted with the news. Bruce Avery, a descendant of the Confederate colonel, who lives on Kent Island, recently dedicated a granite marker at the Rose Hill Cemetery in his ancestor’s honor. I circled back and included this story in the Wagon Train of Wounded chapter of the retreat manuscript today, as this story was just too good not to include. I’m certainly happy for the Avery family, but between the Battles of Antietam and South Mountain and the men who died during the retreat from Gettysburg, there had to have been literally thousands of Confederates left behind in unmarked, shallow, and even temporary graves. I can’t help but wonder how many there are, and whether anyone cares about them in the way that Mr. Clem obviously was moved by Avery’s story. Stephen W. Sears was kind enough to agree to write a foreword to the Dahlgren biography for me. In addition to being a terrific writer in his own right, Steve’s done a lot of editing in his day, including serving as an editor of the late, lamented American Heritage magazine. Steve not only wrote an excellent foreword for the book, he also gave me some really good suggestions for making it a better book. 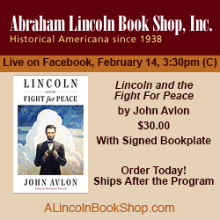 I had originally written the conclusion by presenting the range of possibilities for what Lincoln knew and when he knew it and then permitting the reader to draw his or her own conclusions about this critical issue. Steve suggested that I should instead take a position–tell the reader what I think is the truth, based on the evidence–while dealing with the other possibilities and by using the evidence to eliminate them. I did so. It went through several drafts of re-write, and Steve gave me excellent feedback on each of those drafts. It’s finally done. It’s at the point where I think it’s finished, and where I think that the conclusions stated are well-supported by the evidence at hand. I also added some good new material from the very useful volume of the notebooks of Lt. Col. Theodore Lyman that just add good insight to the overall manuscript, some of which I have already mentioned here. The addition of this material has only further bolstered the quality of this book. I submitted the revised pieces of the manuscript to Dan Hoisington, the publisher of Edinborough Press, who is currently considering the manuscript for publication. We’re back home in Columbus after a long weekend of travel. Due to Susan’s work schedule, we couldn’t leave for Pennsylvania until Thursday morning. We dropped the dogs off on Wednesday night, as the boarding place was not taking drop-offs on Thursday morning. We got out early on Thursday and arrived at my parents’ house about 3:00 on Thursday, after checking in at the hotel. Due to their health and our schedule, we ended up going out to dinner. The problem with going out to dinner on Thanksgiving is that there are no seconds, there are no leftovers, and there is no turkey carcass to pick. I would much prefer to eat at home. We braved the Black Friday crowds, did some shopping for work clothes for Susan, and got to visit with my cousins on Saturday. This morning, we hit the road about 10:30, and the traffic was horrific. It added about an hour to the trip, but we’re home. Many of you have asked about my father and his progress. We spent some quality time with him. The good news is that the hemorrhage has completely re-absorbed, and that he’s doing well physically. He has a deficit on the right side, but he’s learned to compensate for it, and does so quite well. He can walk pretty well with his cane, and he can get around reasonably well. He can feed himself, and he’s actually made remarkable progress from a physical standpoint. However, his speech is definitely a mess. I can only understand about half of what he says, and then have to figure out the rest from context. It’s a major challenge. Although the speech therapists continue to work with him three days a week, with a nifty Apple Power Book notebook running some very specialized (and astonishingly expensive) software, I don’t see it getting any better. He also has a ton of trouble processing names. My cousin David–his nephew–visited yesterday, and my father called him Raymond all day. He knows David’s name, but with things being jumbled, it comes out as Raymond. He called me “hey you” several times, too. When he’s not thinking about names, he does pretty well. However, when he actively thinks about names, that’s when it gets all jumbled. It’s kind of amusing, but at the same time, it’s very frustrating for him and for my mother. The most difficult thing for me is that for the first time, I saw him as a little old man. Up until the day before the stroke, he’d managed to avoid the ravages of age. Even at 86, he was very active and very vigorous. He still drove, he still worked a little bit part time, still did crossword puzzles, did all of the grocery shopping and most of the cooking, and never, ever looked or acted his age. What shocked me on Thursday was the realization that the stroke has finally enabled Mother Nature to catch up to him. He now looks and acts like an 87 year old guy. He’s frail, he needs a cane to walk, he’s cold all the time, and he’s finally acting his age for the first time. Never having seen it before, it really caught me off guard. But, he’s still alive, and all things considered, he’s doing as well as I could possibly have hoped, given the scope and extent of the stroke. Now, I’m hunkered down on the couch for Sunday night football, wearing my brand-new Philadelphia Eagles hoodie. The question is: just how badly are the Patriots going to whup up on the McNabb-less Birds? I hope everyone had a good (and filling) Turkey Day. Tomorrow, it’s back to work and back to the Late Unpleasantness. The year that is drawing towards its close, has been filled with the blessings of fruitful fields and healthful skies. To these bounties, which are so constantly enjoyed that we are prone to forget the source from which they come, others have been added, which are of so extraordinary a nature, that they cannot fail to penetrate and soften even the heart which is habitually insensible to the ever watchful providence of Almighty God. In the midst of a civil war of unequaled magnitude and severity, which has sometimes seemed to foreign States to invite and to provoke their aggression, peace has been preserved with all nations, order has been maintained, the laws have been respected and obeyed, and harmony has prevailed everywhere except in the theatre of military conflict; while that theatre has been greatly contracted by the advancing armies and navies of the Union. Needful diversions of wealth and of strength from the fields of peaceful industry to the national defence, have not arrested the plough, the shuttle or the ship; the axe has enlarged the borders of our settlements, and the mines, as well of iron and coal as of the precious metals, have yielded even more abundantly than heretofore. Population has steadily increased, notwithstanding the waste that has been made in the camp, the siege and the battle-field; and the country, rejoicing in the consiousness of augmented strength and vigor, is permitted to expect continuance of years with large increase of freedom. I am thankful that my father is still alive and doing well after the terrible stroke he had in July. I am thankful that Susan and I are both healthy. I am thankful that we still have Nero and Aurora, even if we lost Augie. I am thankful for the good, brave men and women who defend our liberties here and abroad, and who sacrifice so much to give us the good lives that we lead. I am thankful for having good friends and brothers in arms like J.D., Mike, Steve, Duane and Dr. Dave. I am thankful that George W. Bush will have to vacate the White House in just over a year (a day that cannot come soon enough). I am thankful for publishers who find sufficient merit in my work to want to continue to work with me. I am extremely thankful for each and every person who spends his or her hard-earned money to purchase one of my books, and who chooses one of my works over someone else’s. And most of all, I am extremely thankful to each and every one of you who takes a few moments out of your day to indulge my rantings. To each and every one of you, I am extremely grateful and humbled that you do so. Happy Thanksgiving to you, one and all, and safe travels. On October 8, I posted the good news that the long-overlooked diaries of Lt. Col. Theodore H. Lyman of George Gordon Meade’s staff had finally been published. After an embarrassingly long delay, I finally got around to buying a copy of it tonight. The first thing that I did was go to the index to see whether there were any references to Ulric Dahlgren or to the Kilpatrick-Dahlgren Raid, and I wasn’t disappointed. This passage appears on pp. 123-124 of the book. Wow. I never doubted the authenticity of the documents. I’ve got an appendix in the Dahlgren bio that should settle the question of the authenticity of the Dahlgren Papers once and for all. In addition, I’d concluded in my own mind that, aside from Meade lying to protect his subordinates, Kilpatrick was intimately involved in the plot, but this really causes me to reconsider things. I’ve now come to the conclusion that one of two things happened here. First, and most likely, is that Kilpatrick and Edwin Stanton cooked up the scheme to kill Davis and his cabinet, and that they sucked the unsuspecting Ulric Dahlgren into the plot, and that when he was conveniently killed, they were able to keep their skirts clear by blaming it all on him, knowing full well that there was nobody else to contradict them. The less likely scenario is that this was something that Kilpatrick and Ully Dahlgren cooked up on their own without the sanction or permission of the War Department or the high command of the Army of the Potomac. I view this as far less likely, largely because Dahlgren only joined the expedition after it had been approved by both Lincoln and the War Department. It certainly is tantalizing. I think, however, that I’ve now concluded definitely that Dahlgren ended up being a patsy in a bigger game being played by Stanton and Kilpatrick, and this last little piece of evidence clinches it for me. My original conclusion to the Dahlgren bio was a bit wishy-washy, in that I presented the options and left it to the reader to decide. Stephen W. Sears read the manuscript for me (and wrote a really nice foreword for it) and persuaded me that I should actually draw a conclusion and argue it, and that’s what I’ve decided to do. It’s now going to say that I believe that Dahlgren was a patsy who ended up a victim of the scheming of Kilpatrick and Stanton. I know that what I’m about to say won’t sit well with some of my friends/peers in the preservation community. As I have said here previously, I very much take a pragmatic approach to battlefield preservation, recognizing that not every inch of battlefield land can possibly be preserved. Given that fact, I believe that it makes sense to pick preservation fights wisely. This post stems directly from an excellent comment posted here today by Charles Kann. I got to thinking about Charles’ post and, after responding to him, decided to expand my response into a full-blown post here. Again, I know that what I’m about to say will rankle some of my colleagues in the preservation community, but it can’t be helped. This is something I feel strongly about. There’s been a lot of discussion–blowing and cussing, in many instances–about proposals to build a Target store on the site of Camp Letterman in Gettysburg. Camp Letterman, named for the chief medical officer of the Army of the Potomac, was the main U.S. Army military hospital in Gettysburg, developed AFTER the battle. The land where Camp Letterman sat was not part of the battlefield proper and did not see any significant fighting. It also happens to be located on U.S. Route 30 (also known as the York Pike), and is PRIME commercial development land. Part of it has already been developed for commercial usage. It therefore seems obvious to me that the remaining portion of the Camp Letterman site was bound to be developed sooner or later. It had little to do with the actual battle; what happened there was post-battle. Consequently, I don’t feel particularly strongly about its preservation. If it was bound to be developed sooner or later, why wasn’t that site chosen for the new visitor’s center? It might not have been preserved perfectly, but at least some of it would have been preserved in a fashion that emphasized its historic past, and it would not have placed the new visitor’s center on important battlefield ground in the form of Kinzie’s Knoll. It seems to me that a great opportunity was lost to do something to recognize the historic nature of that ground and to make it possible to have some commemoration of what happened there was lost. Just a thought. I know that the good folks of the Gettysburg Battlefield Preservation Association are vehemently opposed to the development of the Camp Letterman site. I respect their activities a great deal; this organization is solely responsible for saving the important Daniel Lady Farm site. However, I tend to find its somewhat extreme point of view of resisting EVERY development idea to be counterproductive. I know that they will not agree with me on this issue. I just think that preservation needs to be pursued pragmatically, not as a crusade. I view this as a prime example of how a pragmatic approach might have accomplished something important for battlefield preservation. It’s entirely possible that I will get hate mail for this post–and I hope I don’t–but this is something that I firmly believe. Old friend Jim Morgan asked me to put up an announcement here that he will be speaking on his excellent book on the Battle of Ball’s Bluff before the New York Civil War Roundtable on December 12. I’ve included a link to Roundtable’s page that provides the necessary information for anyone who might be interested in attending. Jim’s written an excellent book on a small but extremely important early battle in the Eastern Theater. From June 19-22, 2008, I will be leading a tour for the Civil War Education Association titled The Clash of Cavalry in Virginia. I will be the sole tour leader for this event. Join the CWEA for a tour of some of the most hard-fought cavalry actions of the American Civil War. We will tour three cavalry battlefields in Culpeper County, and one in Louisa County. 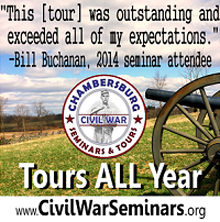 Join Civil War cavalry historian Eric J. Wittenberg for this intensive tour of the cavalry actions of 1863 and 1864. The March 17, 1863 Battle of Kelly’s Ford marked one of the earliest large scale clashes of the Cavalry Corps of the Army of the Potomac and Jeb Stuart’s vaunted cavaliers. With a division of veteran cavalry, Brig. Gen. William W. Averell’s horsemen splashed across the Rappahannock River early on St. Patrick’s Day. They spent the day tangling with the Virginia troopers of Brig. Gen. Fitzhugh Lee’s brigade in a hard-fought clash that led to the death of Maj. John Pelham, Jeb Stuart’s chief of horse artillery, who unwisely joined a saber charge by some of Fitz Lee’s troopers and paid for his poor decision with his life. At the end of a long day of fighting, Averell withdrew, leaving the battlefield in Stuart’s hands. The Battle of Kelly’s Ford is notable as one of the first times that the Federal cavalry went boot-to-boot with Stuart’s vaunted cavaliers. We will tour the Kelly’s Ford battlefield on Friday. Kelly’s Ford also factors into the June 9, 1863 Battle of Brandy Station, the largest cavalry battle fought on the North American continent. On June 9, 1863, 12,000 Yankee troopers crossed the Rappahannock at Beverly’s and Kelly’s Fords and caught Stuart’s cavalry by surprise. In a fourteen hour engagement that featured mounted saber charges and countercharges as well as heavily contested dismounted fighting. In addition to seeing the Kelly’s Ford crossings, we will see the main battlefield, including a visit to Buford’s Knoll, the ruins of St. James Church, site of hand-to-hand fighting, Fleetwood Hill, Yew Ridge, and Stevensburg. We will also see the site of the Grand Review of Stuart’s cavalry that occurred the day before the great battle at Brandy Station as we continue our tours on Friday. On Saturday, we will travel to Louisa County for a tour of the Trevilian Station battlefield. Fought on June 11-12, 1864, Trevilian Station was the largest all-cavalry battle of the Civil War. Maj. Gen. Wade Hampton, commanding 6,000 Confederate cavalry, soundly defeated Maj. Gen. Philip H. Sheridan’s 9300 Federal troopers in two long, brutal days of fighting. Although most of the fighting at Trevilian Station occurred dismounted, there were significant mounted charges. We will tour the first and second day’s battlefields, and we will end with a visit to Oakwood Cemetery in nearby Louisa. We will also hear about the battlefield preservation efforts of the Trevilian Station Battlefield Foundation. On Sunday, we will visit the famed “Graffiti House”, where we will hear about the preservation work that has accomplished so much at Brandy Station, and then we will visit the town of Culpeper. Culpeper sites include Lt. Gen. A. P. Hill’s childhood home, the train station, which was the site of a small but nasty cavalry engagement that occurred on September 13, 1863, when Judson Kilpatrick’s Federal cavalry division made a dash on Confederate supply trains in the town of Culpeper. We will conclude our tours with a visit to the Culpeper National Cemetery, where Union battle dead from both Brandy Station and Trevilian Station rest. I hope that some of you will be able to make it. At only $395 (including 2 lunches and a cookout on Saturday night), it really is a bargain. I know I’m really looking forward to it. Some of you might recall that I had breathlessly announced that the retreat book was not only finished, but that it had been submitted to the publisher, Ted Savas. Last night, my friend Scott Mingus spoke to the Central Ohio Civil War Roundtable, and brought me a copy of his new book, Human Interest Stories of the Gettysburg Campaign, Vol. 2. Sure enough, while thumbing through the book last night, I found six really nifty items that ought to be included in the retreat book, as they really add to the story. So, today, I had to call Ted Savas and get permission to add stuff (Ted has already complained that the thing is too long), which he readily gave. So, now I have to add material to the book.